I love to try out recipes on my co-workers. This week, they were treated to Bailey's Irish Cream Brownies. I found this recipe over at Bake or Break. Thanks for sharing such a delicious recipe, Jennifer! These, needless to say, were a big hit with the folks at work. Hope you enjoy them, too! Place the butter and chocolate into a medium saucepan and melt gently over low heat while stirring frequently. Remove the mixture from the heat and allow to cool. Preheat the oven to 350°F. Line a 13×9 inch baking pan with aluminum foil. Coat the foil lightly with non-stick cooking spray. Using an electric mixer, beat the sugar and eggs together in a medium bowl until light and fluffy (this took about 3-4 minutes with my mixer). Sift the flour and salt together; add to the sugar mixture in three half-cup increments. Add in the chocolate mixture by folding it into the sugar mixture. In another medium bowl, combine the cream cheese and sugar and beat until creamy. Continue to beat while adding the egg and liqueur. Pour half of the brownie batter into the pan. 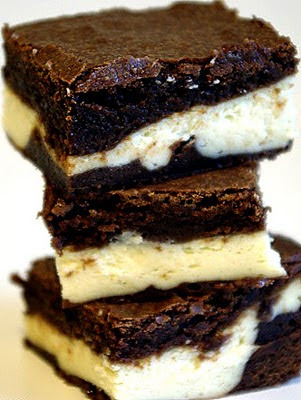 Spread all of the the cream cheese layer over the brownie layer. 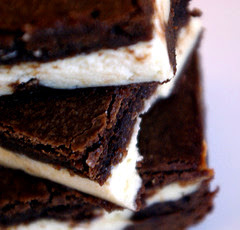 Pour the remaining brownie batter over the cream cheese layer and using an offset spatula, smooth the batter. To create a marbled effect, swirl the layers together with a knife. Bake for 40 minutes; cool completely before cutting. This looks like the perfect holiday recipe - we'll definitely have to give this a try. Belle, Ward & Kevin - thank you! I thoroughly enjoyed them & hope you do as well. They are so easy and so tasty! i made these for mothers day ... came out great!!! Could I use whole wheat flour, and it not take away from the recipe? What about reduced fat cream cheese? Wicked Baker...thanks, I'm glad they were a part of your Mother's Day! Stephanie - I think whole wheat flour would produce a more dense brownie with a slightly different flavor (maybe nuttier). I would try using whole wheat and see if you like the taste and consistency. Be sure to use 7/8 cup whole wheat flour for each cup of all purpose flour called for in the recipe. As for light cream cheese, I say go for it...won't be as rich, but it'll have fewer calories. Good luck - come back and let me know what happens! Andrea...you're welcome! Thanks for stopping by - I'm sure the teachers will really appreciate your thoughtfulness! Hi Elizabeth, when you say to line the pan with foil, just the bottom, or up all four sides as well? Thanks! Hi Laura - I would suggest cutting one, long piece of foil several inches longer than you need so that it goes up and over two (opposing) sides of the pan...then you'll have something to use to lift the brownies out of the pan. Let me know how they turned out! OH MY LORD, Elizabeth! These came out so good! I had to cook them another 10 minutes beyond the recommended 40 because it was still very jiggly in the center. Then I let them cool completely, put them in the refrigerator overnight, and cut them into small squares while very cold, the next day. They are EXQUISITE, and my husband loves them!!! We're going to have them with some vanilla ice cream tonight. Thanks so much for the recipe! Laura - I'm so glad you're happy with them! Cooking times can vary due to different ovens and how they are calibrated...I'm glad you had a close eye on them! Enjoy your brownies! The only issue I seemed to have with these brownies was that it took them quite a bit longer than 40 minutes to cook. But other than that, delicious!! Hi Lauren - each oven can be slightly different; when I moved last year, I had to get used to a "new" oven that runs a lot hotter than my old one and I unfortunately burned a few things in the process. Glad that didn't happen to you! ;) Happy that you liked the result! I wonder how kalhua would taste in the brownie part hmmm Im going to try that tonight because kalhua chocolate brownie with baileys irish cream cheese cake sounds freakin amazing! how was it? because your idea DOES sound amazing! Hi Jean, although I've never frozen them myself, I suspect they'd do just fine. Brownies are freezable, and the cream cheese marbled through these has the texture of a cheesecake. I've had a frozen cheesecake or two in my time, and they freeze well, too. I'd just be sure they're wrapped up tightly. Enjoy! These were okay. I have had much better brownies with Baileys. Neither my husband or myself could taste any Baileys and I even put some in the brownie batter.